A downtown Kelowna ferry dock that once served as a location to greet visitors will again become an important community welcome point for the millions of annual visitors and residents as they explore Kelowna’s four seasons of activities. 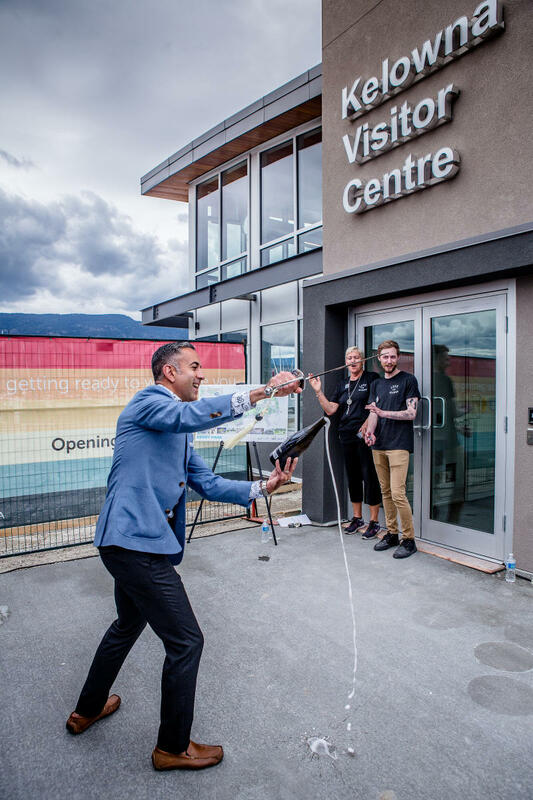 The new Kelowna Visitor Centre opened today in advance of the Canada Day long weekend and busy summer travel months. The downtown location will take full advantage of the 420,000 pedestrians that walk the waterfront boardwalk each year. 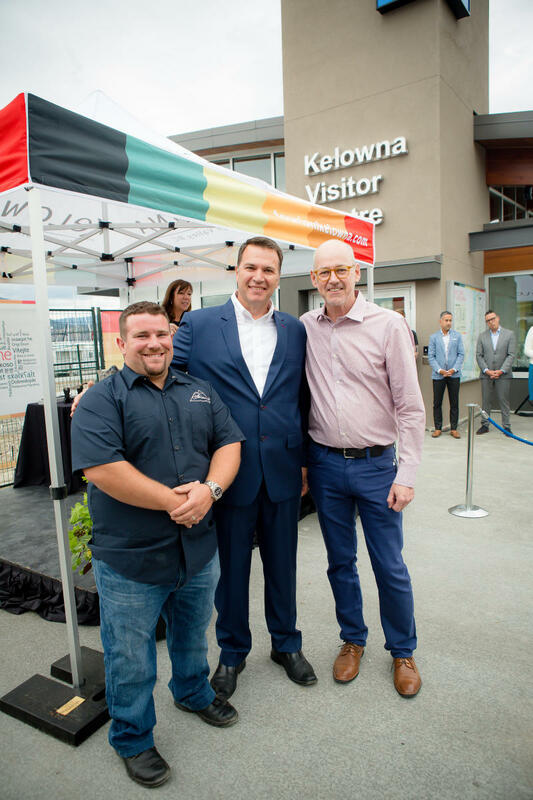 "Tourism Kelowna is proud and excited to open our new Kelowna Visitor Centre as an important new addition to our community," said Thom Killingsworth, Chair of Tourism Kelowna&apos;s Board of Directors. "As a sought-after and growing destination for visitors, and an incredible place to call home, we look forward to serving our community and visitors who come from across the world. 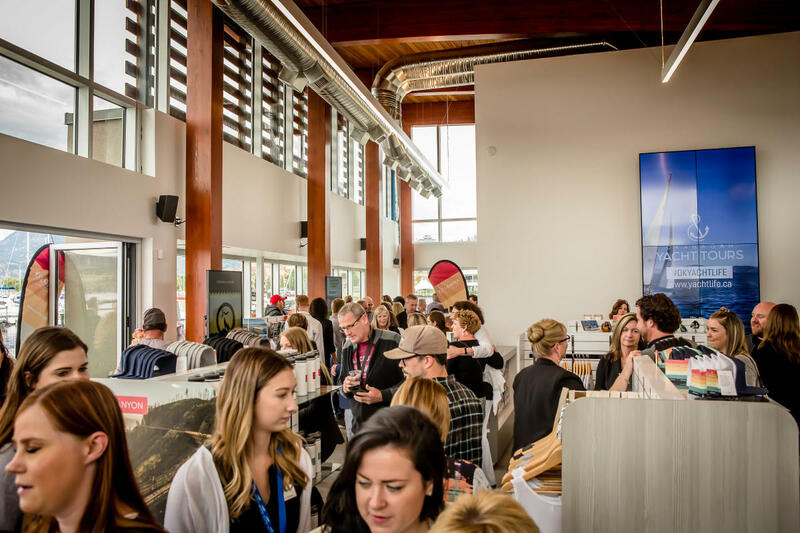 A strong visitor experience includes as well-positioned visitor information centre and innovative visitor experience strategy, which will keep visitors coming back to Kelowna and continued growth of our local economy." The Kelowna Visitor Centre was delivered on schedule and on budget at $2.8 million. Throughout the project, environmental assessment reports were completed with no issues to report. Initial site preparation started on the project in late November 2017. Local commercial and general contractor ANR Construction was awarded the bid. Local firms Meiklejohn Architects and SSA Quantity Surveyors worked with Tourism Kelowna to manage and complete the project. The project team and tradespeople worked hard through the winter months despite snow and cool temperatures that persisted late into February. The building’s large support beams were installed in early April allowing for the building’s framing to be completed, and by the end of April, the roof was in place. The building’s plumbing and electrical work continued through May as glass installation started. By June the building’s exterior was essentially complete and drywalling and interior mechanical work was well underway. 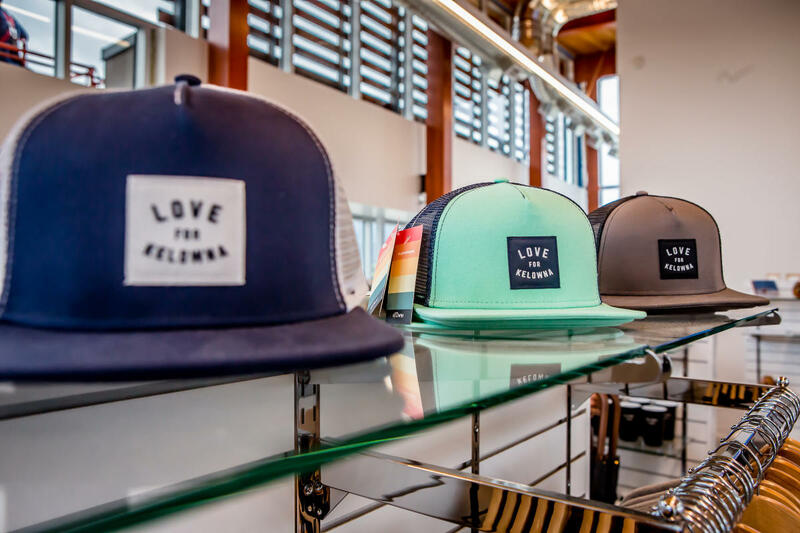 Behind the scenes, Tourism Kelowna was building enhanced services, ordering custom retail items and beginning logistical work for an accelerated move-in. A parallel project by the City of Kelowna for landscaping work to revitalize Kerry Park will continue into July. In all, Tourism Kelowna packed and closed the former location, moved in, and set up the new location in less than a week. Set-up of the new Kelowna Visitor Centre occurred in less than 48 hours. Throughout the move-out and move-in, a mobile visitor information kiosk was available to help visitors in person and Tourism Kelowna staff and volunteers continued to help visitors at the airport kiosk, on telephone and through web chat and social media platforms. 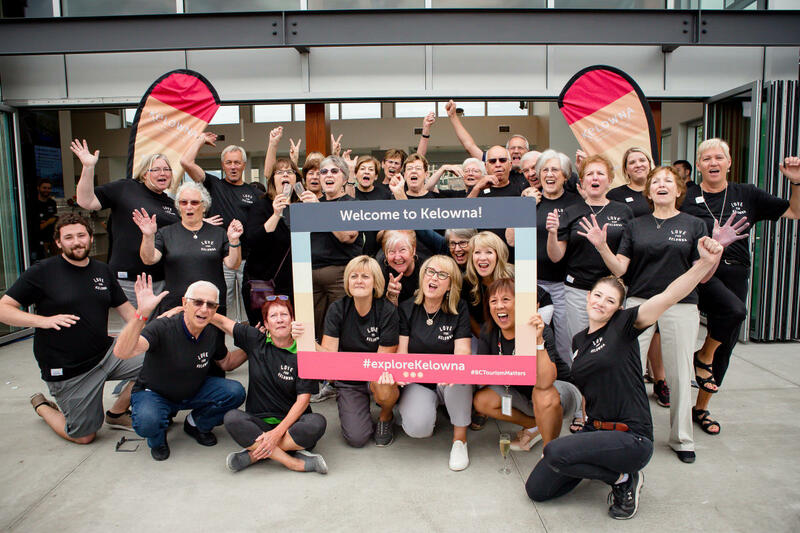 Now, Tourism Kelowna’s visitor experience team, which includes 60 enthusiastic volunteers, is ready to take full advantage of the new location, and expects to assist over 100,000 visitors and residents each year. Starting today, the visitor centre hours of operation will be expanded through the summer months from 9 a.m. to 9 p.m. daily. A new retail program will help residents and visitors find a perfect gift or keepsake to remind them of their time in Kelowna and area. Limited-edition merchandise and custom, local products will be featured and rotated seasonally. An enhanced experience booking system with real-time inventory will reserve remarkable Kelowna and Okanagan Valley experiences for residents and visitors, and the visitor experience team will continue to sell event tickets, bus passes, offer free public WI-FI, and make reservations at local attractions and accommodations for guests. The new Kelowna Visitor Centre also offers additional opportunities to profile local businesses to visit while in the area. A former parking lot has been transformed into a welcoming public building filled with ideas of what to explore, and local experts to help plan and guide a memorable visit. Five gender-neutral public washrooms and a water refill station and fountain are available. Tourism Kelowna’s mobile visitor centre will also pop up at events and locations around town to assist and engage with residents and visitors. Tourism Kelowna will also continue to operate a visitor information kiosk at Kelowna International Airport. "We recognize tourism injects millions of dollars into the local economy and creates jobs in our city," said Mayor Colin Basran. 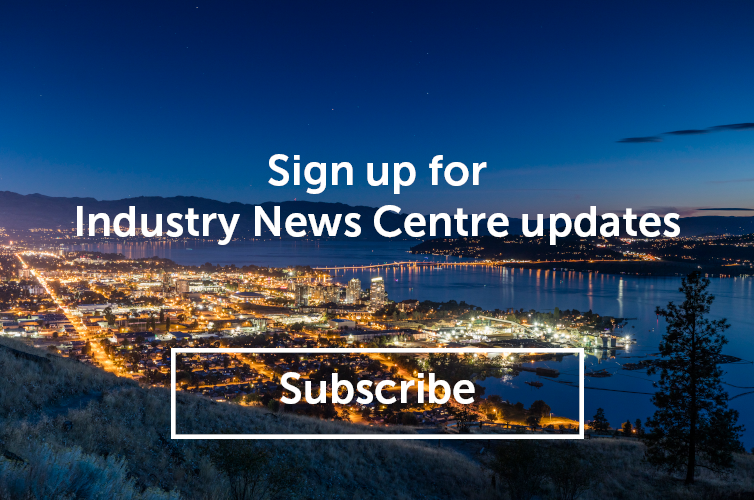 "A new home for Tourism Kelowna has been a Council priority since 2012 and the City&apos;s contribution of land for the Kelowna Visitor Centre through a 29-year non-market lease will help meet the needs of residents and visitors to keep our economy moving." In addition, a number of local businesses have stepped forward and provided financial contributions, equipment, or services to help offset construction costs, including Argus Properties Ltd., Quails’ Gate Winery, ANR Construction, GetintheLoop, Kelowna Springs Golf Club, SSA Quantity Surveyors Ltd., Andre’s Electronic Experts, CedarCreek Estate Winery, Kelowna Ramada Hotel and Conference Centre, Kelowna Rockets Hockey Club, ROV Consulting Inc., Meiklejohn Architects, Pihl Law Corporation, Prospera Place, and Valley Mitsubishi. Tourism Kelowna will continue to raise funds and seek grants. The remaining project costs will be paid entirely by Tourism Kelowna. As the lead destination marketing organization for the Central Okanagan, Tourism Kelowna works on behalf of 400 local businesses and an entire tourism community to generate overnight visitor demand that economically benefits Kelowna and its surrounding areas. A four-season outdoor playground, Kelowna attracts 2 million visitors annually who in turn generate $337 million in local spending. A vital economic driver for the region, Kelowna’s tourism industry provides 12,000 jobs, $142 million in tax revenue and generates $1.25 billion in total economic output annually.